Sister Lourdes, a Carmelite nun, formerly Chin-Chin Gutierrez, an actress and environmentalist. 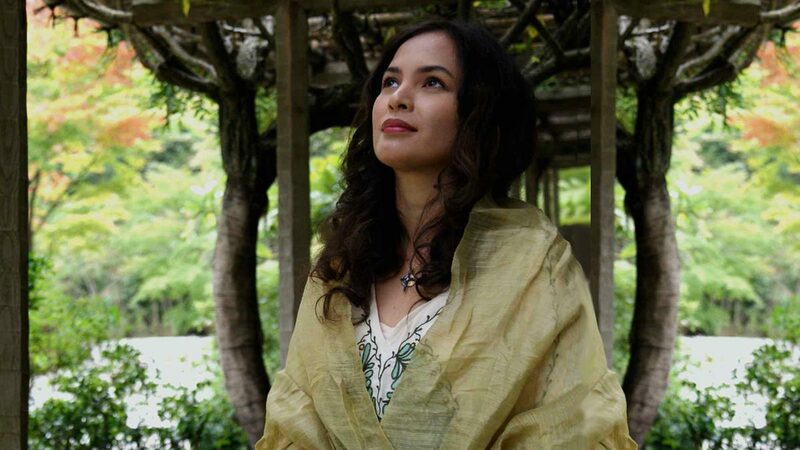 Former actress Chin-Chin Gutierrez is now a fully consecrated nun. As mentioned on a viral Facebook post dated March 29, the former actress-environmentalist now goes by the name "Sister Lourdes." Chin-Chin was consecrated at the Carmelite Convent. The daughter of botanist Dr. Hermes Gutierrez and former Franciscan nun-turned-painter Cecilia Arnaldo, Chin-Chin said she has always felt the call to serve the Lord throughout her life. She recounted in a video interview Portraits in Faith on YouTube that the first major sign came to her when her philosophy professor in college challenged her notion about the existence of God. She said, "Believe it or not, it actually touched a core in my being. The fact that we could question the existence of God in a very Catholic school. "There's more beyond that we can all comprehend and what we are conditoned to believe is probably a beginning, but truth is the journey that He wants us to all take. "Just like a father to a child, to his daughter, He would love that His daughter knows Him personally. And truly, just not know about Him, about His works... so I said, 'Yes, I will take that journey. "'I will not turn my back on anything. I will just expand myself and let You form and mold me.'" This interview was uploaded in September 2013. Chin-Chin was mostly known for her kontrabida roles in teleseryes. One of her more famous roles was as Corazon Roxas vda. de Berenguer in Maging Sino Ka Man, the John Lloyd Cruz-Bea Alonzo hit series that ran from 2006 to 2008. Her version of Maria Clara in the '90s television adaptation of Jose Rizal's novel, Noli Me Tangere, was also memorable. The former actress believed that this particular role marked a significant part in her journey. "Noli Me Tangere for me was sort of, like, a scientific and anthropological and spiritual study of our society in those days, in the late 1800s. "And as a doctor, it's no wonder he diagnosed our society to have cancer. This is the cancer of our society today. How are we going to be tomorrow? "And that was more than a hundred years ago, when people didn't really have access to education or to the existence of consciousness. "But we had our native intelligence that was always there. The soul that knew. "And I think Jose Rizal had perceived that soul, that Filipino soul that was untouchable. And it was his expression to tell others that we have a soul. "A soul that will refresh us, sustain us..."
She initially studied Communication Arts to pursue a career as an investigative journalist, but her path seemed to be steering her towards showbiz. And around the time she was doing Noli Me Tangere, Chin-Chin was "confronted with a question." Somehow, this question tied back to what her philosophy professor told her. "If God is leading me to this 'business' or this industry, let it be a way for me to find Him because showbiz was really not the safest path to take. "By grace, I knew that, but I didn't know what showbiz was all about. "The culture of materialism and masks and illusions was surrounding us, but I feel if the artist knows its soul, then we can still use the medium and preserve that integrity in any project. "I found ways, and the Lord had shown me ways... For some reason, I was guided by the right people, the right circumstances to make the right decisions." Chin-Chin's last major acting project was in 2010's Dahil May Isang Ikaw in ABS-CBN. During her active years in showbiz, Chin-Chin used the spotlight to bring attention to her advocacy for environmental sustainability. For her, taking care of the environment meant preserving the sacredness of life. She related in the same 2013 interview, "It's not just about survival. I realized in the last 15 years, environmental issues and movement is not just about our human rights to live and sustainability. "It's also about our sanctification. It's also about our sacredness. It's all about knowing we are home and treating one another as part of home. "Not just people, but every being that has life is part of our scaredness. "Right now, I'm just looking at all the thousand of species in the rainforest, we can't continue fighting each other. We have to start looking ourselves as a community. "How to find that common union? That common unity? "We have to take very, very crucial steps in how we address healing our land and our relationships, I believe. "Because the Earth can live for another 1.5 billion years. But with global warming, climate change, can we as a human being survive as a species on Earth? "So, it's a very real mission, a very real journey as well." Year 2006 was a major turning point in Chin-Chin's journey. "It's not that random that, when we are prompted in our souls to or called for a certain part of the journey. There are parts of the journey and then there's the whole journey itself. "Somehow, God wishes us to know Him. I don't think He wants to remain a mystery for us. "Let's say Christ Himself would call God Abba, Father. There are so many clues already about this relationship, and religion, traditions are ways, all paths to our common union. "My mother would always say, 'Whatever you become, Chin, whatever you chose, remember we have one purpose in life. "'And that is to remember our way back to God.'" In December of that year, Chin-Chin and her mother faced a "crucial" moment in their lives. Her mother was hospitalized and at a critical state. Chin-Chin continued, "We were in and out of the ICU, the ER. She was really collapsing. Her body was in a collapse. "If it was not her kidneys, it was her heart. If it was not the blood pressure, it was waters spilling out of her cells..."
She recounted one fateful exchange with the Lord in between those moments. "At one moment, we really have to embrace that solitude and that silence and that reckoning with our divine origins. "Where we come from, where we're going? That's our birth right to ask. "And if there's a mission, I said, then so be it... let my words be the first movement of my acceptance, total acceptance, and total offering. "Then take away everything that is not necessary." After that key prayer to the Lord, Chin-Chin was given an answer in the form of a near tragedy—a house fire. Chin-Chin's Quezon City home was completely burned to the ground on December 20, 2006. "I woke three o'clock in the morning. I was woken up," the former actress narrated. "It was a very quiet fire. Not even the neighbors—nobody knew. "I opened the door of my bedroom and, 'Oh, there's a fire.' I closed the door, go back to sleep—There's a fire? "I jumped over the banister because at that time, the fire, tons of fires. It was like, the floor to the ceiling. "I just found my body was just following and I was hardly awake, but I knew what to do. "I was looking at the fire, I landed on the floor downstairs. Crushed my heel, compacted my spine. I was able to move by grace again. We carried my mom out to the garden. "In minutes, the whole house was devoured by the fire. It was contained because it was built with stone." Chin-Chin got second to third degree burns from the fire, but she didn't feel any pain. In fact, she felt that her "spirit was prepared for this." While the nurses attended to her in the emergency room, she said a quiet prayer, "Heavenly Father, what do I do? What do I have to do? "'I have a watch,' 'So, watch.' 'I have a rosary,' 'So, pray.' Watch and pray? "'I have the Miraculous Medal still strong on my...' 'So, bear witness.' Watch, pray, and bear witness. Okay. "And then there was a nurse who was patting my shin to comfort me, and that's when I started to realize where I was. It's like my spirit went back into... emotions were alive again. "'I'm alright, but I want to know your name.' And he said, 'Espirito.'" Chin-Chin smiled to herself at the memory of it and recalled connecting the message in her head, "Okay, watch, pray, bear witness in the spirit. Live in the spirit. "Who's going to be responsible for my soul? Okay, the spirit—God. "God is our soul. God is our... there's no more questions, only God. No more answers, only God. I have no knowledge, only God. I am nothing, only God. No vocation, only God." Chin-Chin faced the tragedy of losing her mother three weeks after the fire, but as she described it to PEP.ph (Philippine Entertainment Portal) back in January 2007, it was a "peaceful send-off." Life continued for the former actress after both events. And with renewed sense of purpose, Chin-Chin recalled asking herself and the Lord three questions: "What do I put to a close? What do I continue? And what do I begin?" Whatever the answers would be, she reminded herself to accept it openly. Speaking in Portraits in Faith, Chin-Chin related it to the shoreline. She said, "The shoreline is so beautiful. Jesus always walks along the shoreline. It doesn't cut. It goes up, and then it recedes. "If your life has to recede, accept the pace. The beauty of that receding. "And then even when it has to rise, accept to face that. "You have to face new shores, you have to leap into the new life. "We all want to be understood and to be understand. We all want to be love and to be loved."